Second, if you would like to exchange holiday cards with us, please email us at TheFurryBambinos AT gmail DOT com. When we last left off telling you about Mama Rose and Her Babies, four bebbeh kittehs and Mama Rose had been trapped in humane traps in Penny and Bob’s yard next door. Mommy and Daddy transferred the feral fambly to cages in the garage. But Mommy and Daddy knew that there were more kittens – another two or three by their estimation. When it got dark, Daddy rigged the cage so that the door would not close, in case another animal such as a raccoon, possum, or skunk got hungry and went into the trap. Mommy and Daddy were very worried about the other bebbehs. They worried all night about where they might be, if they missed their Mama and siblings, and what they would eat. It was a sad night at Casa de Furry Bambinos, despite the fact that four bebbehs and Mama had been trapped. The next morning Penny called Mom. She said that there were two bebbeh kittehs in one of the traps! The wire that was holding the trap open must have broken! What good luck that more kittehs were trapped, and not a skunk!!! Mommy and Daddy were very grateful to have caught two more bebbehs! When Mommy opened the door from the house into the garage, the sound must have startled all the feral kittehs. 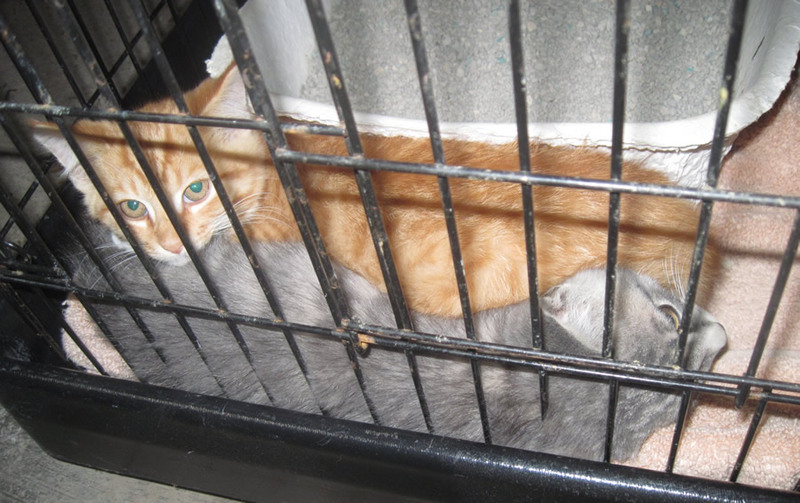 So much so that two of the kittehs were squeezing between the bars of their cage to escape! Mommy got there in time to push the dark orange kitteh back into the cage, but there was one itteh bitteh calico kitteh on the loose in the garage! Luckily Mommy saw where the calico went, and was able to pick it up by the scruff of the neck and put it back into a different cage. (Mommy thought that maybe she should separate the two genius kittehs who figured out how to escape.) So then Mommy grabbed some bricks from the back yard and blockaded the bottom of the cages to prevent any more escapees. Finally, Mommy went next door and brought the two kittehs in their trap to the garage. Mommy put them into the cage with the orange kitteh who tried to escape. At this point, Mama and all the bebbehs were very very scared, so Mommy did not try to touch any of them yet. These two bebbehs were trying to hide between their litter box and the cage wall. Look how frightened they look! Mommy and Daddy were not sure which bebbehs were girls or boys. Mom had some guesses, though. Orange tabby (striped) kittehs are usually male – Mom read somewhere that 75% of orange tabbies are boys. One of the bebbehs was a dark orange tabby with white toes and a white bib. (He’s the one huddling with the silver tabby in the two previous photos.) Mommy guessed “boy” for this little one. He was also the biggest kitteh in the litter. 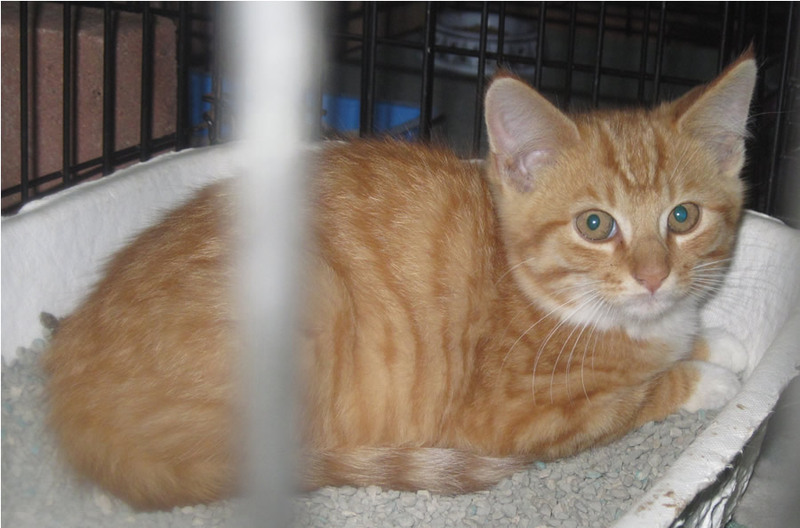 Another kitteh was a dark orange tabby – the one who tried to escape with the calico. Mommy also guessed “boy”. 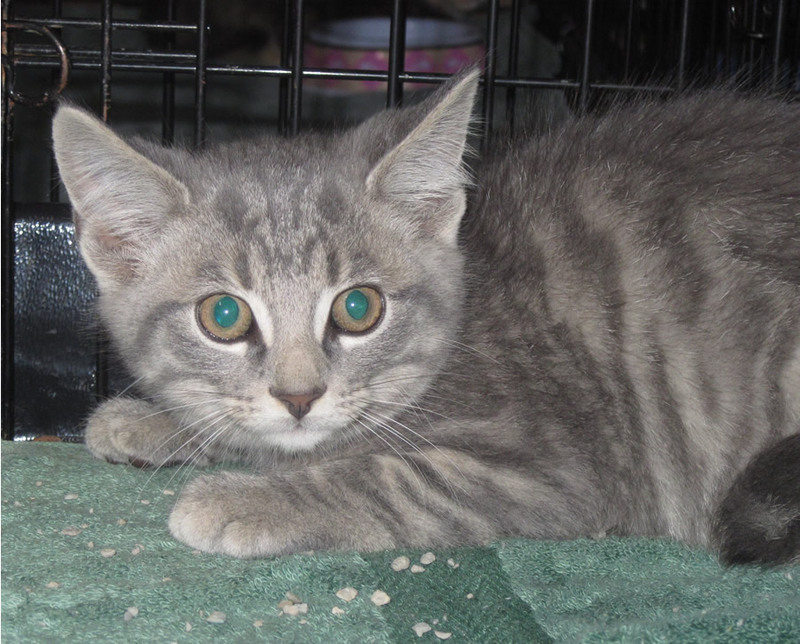 His markings were very pretty – bulls eyes and swirls instead of striped lines on his sides. Another bebbeh was a buff (light orange) tabby, with white toes, a white bib, and a cute little white strip on his nose. Mommy also guessed “boy”. He was one of the last two to be trapped. As you may know, calico kittehs are ALMOST ALWAYS girls. The Mama was a calico, and since she was the Mama, they knew she was a girl. One of the kittens was a calico – the one who escaped the cage – and looked almost exactly like the Mama. So Mommy guessed that the bebbeh calico was a girl. However, calicoes can be males – at the time, one of Mommy’s friends was fostering a MALE calico. It is estimated that only about 1 in 4000 calico kittehs are male. To be calico (or tortie for that matter) a kitteh needs to have two X chromosomes. So male calicoes are XXY – a genetic mutation. Enough science – back to our story. So that left the silver tabby and the brown tabby. Since both of the silver tabby Furry Bambinos (Angel Clyde and Padre) are boys, Mommy guessed “boy” for this little one. He was also pretty big compared to some of his siblings. The brown tabby was tough. It was so tiny – must have been the runt of the litter – so based on body size, Mommy guessed “girl”. However, until Mommy could pick up and handle the bebbehs, she did not want to assign names yet. She started thinking up names though! Originally, Mommy had thought she had seen SEVEN bebbehs with the Mama. So she and Daddy tried for several more days to trap the remaining bebbeh. They don’t for sure if there were seven since they all moved about so quickly – it was very hard to count them. Mommy thought there might be another calico kitteh – but maybe when she was counting, she thought the Mama, who was very tiny herself, was a bebbeh. They never did catch a seventh bebbeh, and we’ll never really know for sure if there was one. Next time, we will tell you about naming the bebbehs! Filed by Cookie on Dec 11th, 2010 under Baby Pictures, Cookie's Posts, Feral Kittens, Fosters, Hunter, Mama Rose, Marigold, PAWS, Rusty, Sky, Sunny, Woody. Leave a Purr or Hiss. Hurrah! You got SIX! Amazingly well done. The dark orange “boy” look JUST like our Scouty! Down to the airplane ears…he still does that, in fact. We are glad you caught six babies. We are enjoying hearing about them. Good work getting so many of them! Such a cute family too. We love the orange ones in particular because we lost our orange boy many years ago. Oh, they do look very skerred! How lucky that you were able to trap 2 more. What an interesting story. So much concern and work but the kitties were safely captured. We are way behind in visiting, and wow have you been busy, too! Good news about your successes with trapping mama and kits…Teri is still trying to trap TomTom (and like you, not raccoons, possums or skunks) but so far no luck with TomTom and luckily no skunks, either!